The Category 4 hurricane had a hard time getting its point across about how remorseful it really was. NEW ORLEANS—After a three-year absence spent wallowing in guilt for killing several hundred Louisiana residents and leaving the city in shambles, Hurricane Katrina returned to New Orleans Tuesday to beg the Crescent City for forgiveness, destroying everything in its path and killing hundreds. "I've had a long time to think about what I've done to you all, and I realize now that it was wrong," Hurricane Katrina reportedly told residents. "I knew I shouldn't have been coming in so fast, but I guess I didn't know my own strength. A lot of people have blamed the levees, but if I'm truly honest, I knew they wouldn't hold. It was stupid of me, and for that, I apologize." "Can you ever forgive me?" continued Hurricane Katrina, wiping out the city's electrical grid with its devastating force. According to witnesses, the extremely remorseful 120-mile-wide storm was initially sighted off the Louisiana coast nervously rotating in circles and emitting long sighs that reached 115 mph. After several abandoned attempts to head inland, Hurricane Katrina reportedly gained enough strength and confidence to journey to the center of New Orleans to deliver a statement acknowledging its shame. By this time, however, the catastrophic power of Hurricane Katrina's bumbling apology was too much for the barely repaired levees, which shattered before the storm could even begin enumerating its many regrets. The crestfallen weather system then lurched across the city, inadvertently overturning cars, ripping the roofs off of homes, and violently snapping the neck of every resident it attempted to hug. Upon finally recognizing the destruction it was causing after it demolished a nearby church, Hurricane Katrina attempted to help rebuild the flattened structure, only to have it repeatedly collapse, killing everyone inside. "Oh, not again. I'm such a klutz," said the hurricane, accidentally razing an entire block of the historic French Quarter as it nervously backed away from the church rubble it had swept into a pile. "Sorry! Sorry, guys." Sources confirmed that, in addition to making the heartfelt, impassioned apology, Hurricane Katrina expressed hope that it and the people of New Orleans could continue to work on their relationship and possibly one day become friends. "Please don't run away," said Hurricane Katrina, addressing residents fleeing from a press conference in the now destroyed Superdome. "It's not what you think. I'm not here to hurt you. Oh, jeez. Don't blow away!" 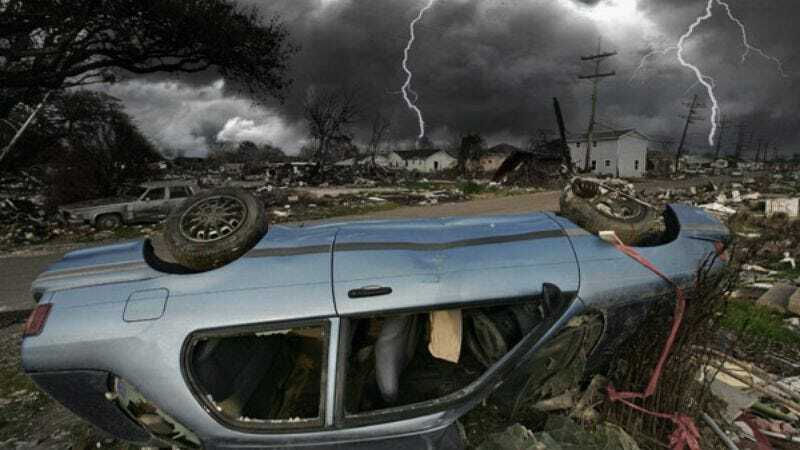 Despite delivering a disastrous "practice apology" to the people of Cuba a day earlier, the hurricane said it felt compelled to speak to the citizens of New Orleans in person, rather than mailing a card or sending good friend Hurricane Rita to do the apologizing. "I want people to look me right in the eye and know that I'm very sorry for what I've done." Hurricane Katrina said. "And for that. Oops, and that as well." As a peace offering, Hurricane Katrina reportedly brought an oil tanker to give to the people of New Orleans. But after the screams had subsided and no one came forth to receive the 10,000-ton gift, the storm left the cargo ship in the middle of the highway "in case anyone wants it later." According to a poll of evacuees, while a minority of those surviving the hurricane's return visit say they believe the storm is truly sorry for what it has done, 60 percent believe the effort was too little too late, another 25 percent believe it will take more than just words to undo the damage, and the remaining 15 percent are missing or in critical condition. "To be honest, I never thought I'd see Katrina again," resident Tom Andrews said while clinging to a piece of driftwood in the floodwaters. "I sort of wish it had stayed away. At this point, it's only making things worse." Though the hurricane admitted the apology was not received nearly as well as expected, the cataclysmic weather event remains convinced that its upcoming visit to the poor people by the waterfront will go more smoothly. "They'll accept me, I just know they will," said Hurricane Katrina, adding that it also wanted to track down all the small children it displaced in 2005 to see how they have grown. "Those people have been put through so much, I'm sure they'll understand." Hurricane Katrina was last seen wandering off toward the Gulf of Mexico, mumbling something about coming back later to see how the city looks once everyone is done rebuilding.